Learning to program makes you a smarter and more capable human being. Computers are not only the most common tool we encounter in our day-to-day lives, but also the most powerful. Even if your plans don't include becoming a software engineer writing code for the next Mars mission, you can find value in learning to code. Rocket science uses programming, but programming isn't rocket science. 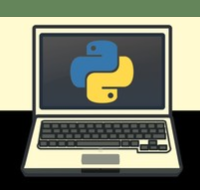 Whether you're preparing for a software career, an office worker with a folder full of spreadsheet files, or a hobbyist interested in making indie video games, the Python programming language is a great way to get started in the world of programming. Get started. It's a great journey. "Introductions to Python are easy to find. But at the end of the day most Python tutorials for beginners end up being the same lessons repackaged, often leaving the new programmer with gaping holes in how their newly acquire skills can be applied practically. This is not one of those books. Where this book stands out is the second part where you actually build useful tools you might need to use every day. The author does a fantastic job of bridging the concepts and skills you learned earlier to real world applications." "This book is totally appropriate for someone who has never programmed before. Everything is explained, right from the ground up, in a lively, interesting style which doesn't dumb things down." "I am a college professor who occasionally teaches courses for liberal arts students. 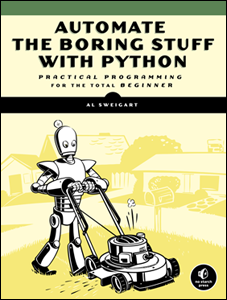 [...] I offered a game programming course in the Python programming language using Sweigart's book. The students loved this book. It starts at the very beginning and leads them, game by fascinating game, to become highly capable programmers." "I'm halfway through this book and very pleased. I have never seen a programming book so accessible to complete beginners. It really gave me the jump start I needed. I use it alongside other resources, but it continues to be the easiest to absorb." "I used to write a column on a greek magazine about learning Python and PyGame. 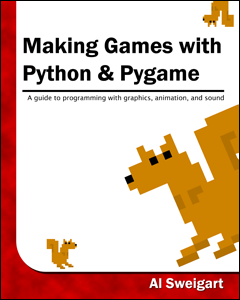 [...] Since I found this book, every time the topic of learning programming is mentioned - especially from a person interested on making games - I point people to it." "It is difficult to write a clear and easy to understand book on programming for a beginner. It is even more difficult to write a clear and understandable book on cryptography for a beginner. To do both at the same time is nearly impossible, but this author has nailed it." "My name is Felix. 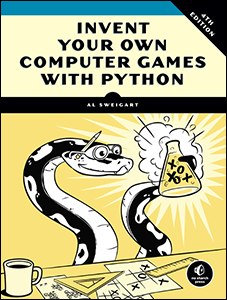 I'm ten years old, and I really liked your book on game programming with python." Everyone in the 21st century needs to learn to code, right? But not everyone needs to become a software engineer or computer scientist. Automate the Boring Stuff with Python is written for office workers, students, administrators, and anyone who uses a computer how to write small, practical programs to automate tasks on their computer. You don't need to know all the complexities of algorithms and syntax, you just want to write basic programs to automate mundane computer tasks. In the process, even total beginners will learn to use Python to control their computers without having to learn complex information about computer science. This is a practical programming guide for the rest of us. You can also take the online course of this book on Udemy. Use coupon code INVENT_WITH_PYTHON to buy the course for $10, an 80% discount! You’ve mined for diamonds, crafted dozens of tools, and built all sorts of structures—but what if you could program robots to do all of that for you in a fraction of the time? In Coding with Minecraft, you’ll create a virtual robot army with Lua, a programming language used by professional game developers. 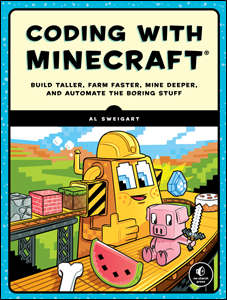 Step-by-step coding projects will show you how to write programs that automatically dig mines, collect materials, craft items, and build anything that you can imagine. Along the way, you’ll explore key computer science concepts like data types, functions, variables, and more. You can get a free review copy of this ebook! 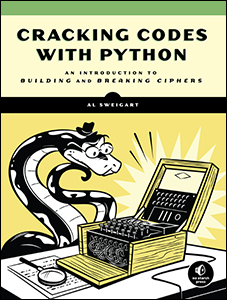 Cracking Codes with Python is the new edition of Hacking Secret Ciphers with Python. 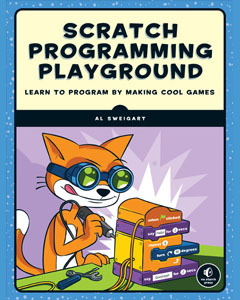 Scratch Programming Playground teaches you how to program in Scratch, the graphical programming language from MIT for ages 8 to 16. It features 8 game and art projects. Scratch Programming Playground is for young adults or parents/teachers who want to lead kids through a fun programming journey. 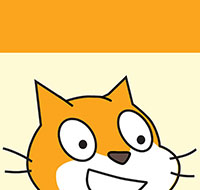 Additionally, there are also many video tutorials on YouTube from the author's website, Invent with Scratch. There is also an online Udemy course that follows the book. You can sign up for free using the coupon code INVENT_WITH_SCRATCH. Use my Udemy referral discount codes. My referral links bring me more income than even paying full price without the referral. If you'd like to pay $15 instead of $10, you can use discount code JUST_SAYING_THANKS for the Python course or pay $10 instead of $0 with the discount code JUST_SAYING_THANKS for my Scratch course. Or purchase these other recommended programming books from the links below. Python Crash Course - Excellent beginner book on par with "Automate the Boring Stuff with Python". Teach Your Kids to Code - A great book for parents and teachers who want to help young adults learn to program. Learn to Program with Minecraft - If your kid likes Minecraft, they'll love using Python to programmatically control their virtual blocky world. Python for Kids - Similar to "Invent Your Own Computer Games with Python", for kids and beginners. Python Pocket Reference - A concise guide to Python for those with some programming experience. Learning Python - The classic, comprehensive introduction to Python. The Quick Python Book - A great book for experienced programmers who are new to Python. Fluent Python - A great intermediate Python book for those looking for the next step. Effective Python - Also a great intermediate Python book for those looking for the next step. Core Python Applications Programming - A thorough Python book for experienced developers. The Linux Command Line - An introduction to the command line, a useful skill for any programmer. Black Hat Python - Python programming for hackers and pentesters. Violent Python - A cookbook for hackers, forensic analysts, penetration testers and security engineers. Al Sweigart is a software developer and tech book author living in San Francisco. Python is his favorite programming language, and he is the developer of several open source modules for it. 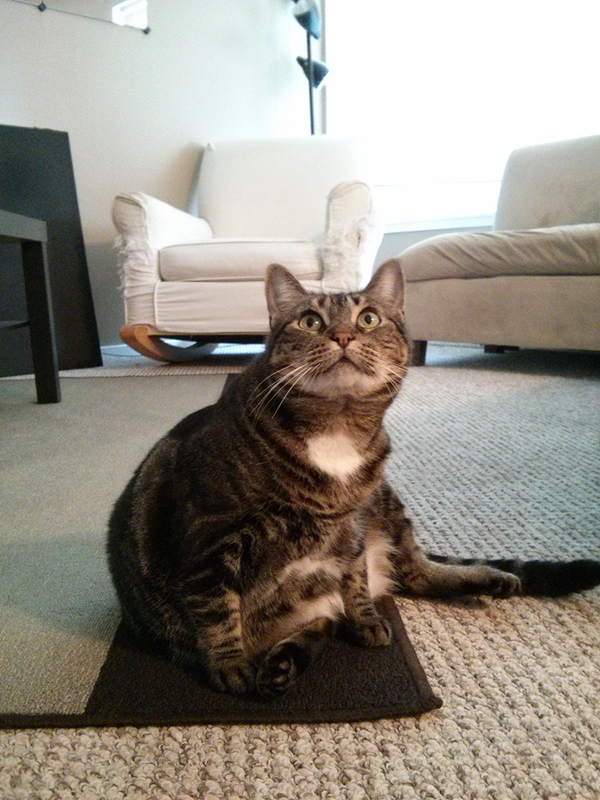 His cat weighs 12 pounds.